Here in this article, we will tell you the types of cloud and what is the advantages and disadvantages of Cloud Computing. Cloud computing is usually described in one of two ways. Cloud deployment model based on the cloud location, or on the service that the cloud is offering. Each type of deployment method and cloud service provides you with different levels of control, flexibility, and management. Understanding the differences between these will help you to decide what set of model and services are right for your needs. 1.Public cloud: In Public cloud, the computing infrastructure is hosted by the cloud vendor at the vendor location. The customer has no visibility and control over where the computing infrastructure is hosted in which a service provider makes resources, such as applications and storage, available to the general public over the Internet. Public cloud services may be free or offered on a pay-per-usage model. The computing infrastructure is shared between the organizations. so we call this as public cloud. Examples of public clouds include Amazon Elastic Compute Cloud (EC2), IBM's Blue Cloud, Sun Cloud, Google AppEngine and Windows Azure Services Platform. 2.Private cloud: The computing infrastructure is implemented within the corporate firewall, under the control of the IT department. and not shared with other organizations. Some experts consider that private clouds are not real examples of cloud computing. Private clouds are more expensive and more secure when compared to public clouds. Private clouds are of two types: On-premise private clouds and externally hosted private clouds. Externally hosted private clouds are also exclusively used by one organization, but are hosted by a third party specializing in cloud infrastructure. Externally hosted private clouds are cheaper than On-premise private clouds. Building a private cloud is often the first step in cloud computing for many organizations. Here's 24 vendors, platforms and service providers you can research for your own private cloud project. 3.Hybrid cloud: Organizations may host critical applications on private clouds and applications with relatively less security concerns on the public cloud. 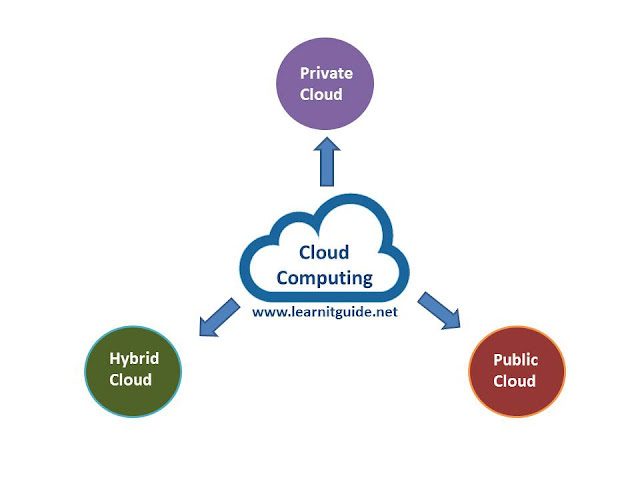 The usage of both private and public clouds together is called hybrid cloud. A related term is Cloud Bursting. In Cloud bursting organization use their own computing infrastructure for normal usage, but access the cloud using services like Salesforce cloud computing for high/peak load requirements. This ensures that a sudden increase in computing requirement is handled gracefully. 4.Community cloud: It involves sharing of computing infrastructure in between organizations of the same community. For example all Government organizations within the state of California may share computing infrastructure on the cloud to manage data related to citizens residing in California. Infrastructure as a Service (IaaS) means you're buying access to raw computing hardware over the Net, such as servers or storage. Since you buy what you need and pay-as-you-go, this is often referred to as utility computing. Ordinary web hosting is a simple example of IaaS: you pay a monthly subscription or a per-megabyte/gigabyte fee to have a hosting company serve up files for your website from their servers. Software as a Service (SaaS) means you use a complete application running on someone else's system. Web-based email and Google Documents are perhaps the best-known examples. Zoho is another well-known SaaS provider offering a variety of office applications online. Platform as a Service (PaaS) means you develop applications using Web-based tools so they run on systems software and hardware provided by another company. So, for example, you might develop your own ecommerce website but have the whole thing, including the shopping cart, checkout, and payment mechanism running on a merchant's server. Google App Engine are examples of PaaS. And also we have many services such as Storage, Database, Information, Process, Application, Integration, Security, Management, Testing-as-a-service. •Lower upfront costs and reduced infrastructure costs. •Easy to grow your applications. •Scale up or down at short notice. •Only pay for what you use. •Overall environmental benefit (lower carbon emissions) of many users efficiently sharing large systems. •Higher ongoing operating costs. Could cloud systems work out more expensive? •Greater dependency on service providers. Can you get problems resolved quickly, even with SLAs? •Risk of being locked into proprietary or vendor-recommended systems? How easily can you migrate to another system or service provider if you need to? •What happens if your supplier suddenly decides to stop supporting a product or system you've come to depend on? •Potential privacy and security risks of putting valuable data on someone else's system in an unknown location? •If lots of people migrate to the cloud, where they're no longer free to develop neat and whizzy new things, what does that imply for the future development of the Internet? •Dependency on a reliable Internet connection. Leave your comments if any.